Cricket lovers can easily trade shares of their favorite teams and players at an online stock exchange, the Cricket Stock Exchange (CSX). Cricketers can be purchased by cricket lovers after watching ball by ball action from scorecard when the match is being played live. Purchasing and selling of stocks will be powered by analyses and performances of the cricketers. Users’ improved performance also be titled as ‘Trader of the Week’ and they will be featured as ‘Highest Gainer of the Week’. Hungama Game Studios has developed Cricket Stock Exchange in corporation with ace cricket analyst Ayaz Memon. Www.cricketstockexchange.com has been launched for trading shares of teams and cricketers by Hungama Game Studio when it has decided to make the most of the ever-lasting notability of cricket amongst the Indians. Cricket Stock Exchange (CSX) is an online game which works similar to the real stock-market. 'Stocks' of cricketers and teams are 'traded' at a virtual stock exchange, CSX. 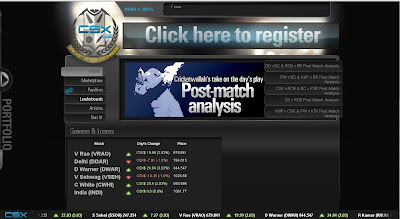 Registration is required for trading at www.cricketstockexchange.com. For registration, search for your favorite team or cricketer and enter the number of stocks you wish to buy. Use the left and right arrow keys that are located on either side of the stock card or the list on the left to browse through the various stock you own. Now keep track of your recent purchase, sell, and trade transactions. Fill all the details such as a valid e-mail ID and a valid mobile number to complete the registration form. You will become the part of the largest cricketing community after registration. Registered users will be provided with CS$ 20,000, the official currency of the Cricket Stock Exchange. This currency can be used in purchasing stocks on the basis of availability and current prices. Shares of Cricketers and Teams are obtainable on the basis of first come first serve. To make money on CSX, customers can take part in the pavilion through SMS. They can also make money through trading. Registered users can go to the marketplace to purchase the stocks of their favorite teams or players. They can track a maximum of 5 of their favorite stocks. They will receive SMS and e-mail notifications regarding these stocks. Simply search for the team or player and click on enter to add a stock to the watchlist. Click on the (-) sign next to the corresponding stock to remove a stock from the watchlist. The Cricket Stock exchange is open 24 hours a day, 7 days a week. The Facebook or Twitter link can follow Cricketwallah on the Cricket Stock Exchange home page. All main cricketing tournaments, which will be held in the years to come, will be covered by the Cricket Stock Exchange. Users must have an interest in cricket to trade at CSX.